An uncommon and extremely attractive 1848 map of the world in hemispheres by J. G. Barbie du Bocage. Shows U.S. claims to British Columbia. Australia is labeled 'Nouvelle Hollande' and 'inconnus.' Africa to is largely unexplored and is labeled 'pays inconnous.' The coast of Antarctica is drawn in sketchily based upon early expeditions. Features a beautiful frame style border. Prepared by J. G. Barbie du Bocage for publication as plate no. 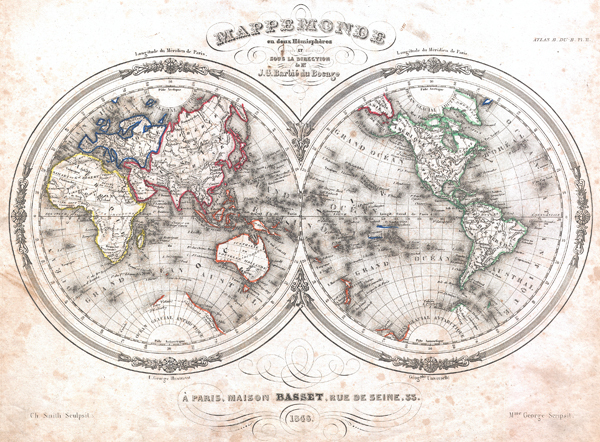 2 in Maison Basset's 1852 edition of the Atlas Illustre. Jean Denis Barbie du Bocage (1760 - 1825) and his son Jean-Guillaume Barbie du Bocage (1795 - 1848) were French cartographers and cosmographers active in Paris during late 18th and early 19th centuries. The elder Barbie du Bocage, Jean Denis, was trained as a cartographer and engraver in the workshops of mapmaking legend J. B. B. d'Anville. At some point Jean Denis held the post of Royal Librarian of France and it was through is associations with d'Anville that the d'Anville collection of nearly 9000 maps was acquired by French Ministry of Foreign Affairs. The younger Barbie du Bocage, Jean-Guillaume, acquired a position shortly afterwards at the Ministry of Foreign Affairs and, in time, became its head, with the title of Geographe du Ministere des Affaires Etrangeres. The Maison Basset (fl. 1830 - 1860) was a French publishing concern active through the mid to late 19th century. From their offices at 33 Rue de Seine, Paris, France, Maison Basset published the works of such prominent French cartographers and engravers as Barbie du Bocage, A. Vuillemin, J. B. Charle, V. Levasseur, Tu. Duvotenay, H. Dufor, F. E. George, and others. Their library of publications is diverse and vast, but heavily focused on medical and scientific texts, including several important atlases. Maison Basset, Atlas Illustre, (1852 issue). Good condition. Exhibits quite a bit of foxing throughout - see images. Else attractive and unusual.